Welcome to Fashion Friday! 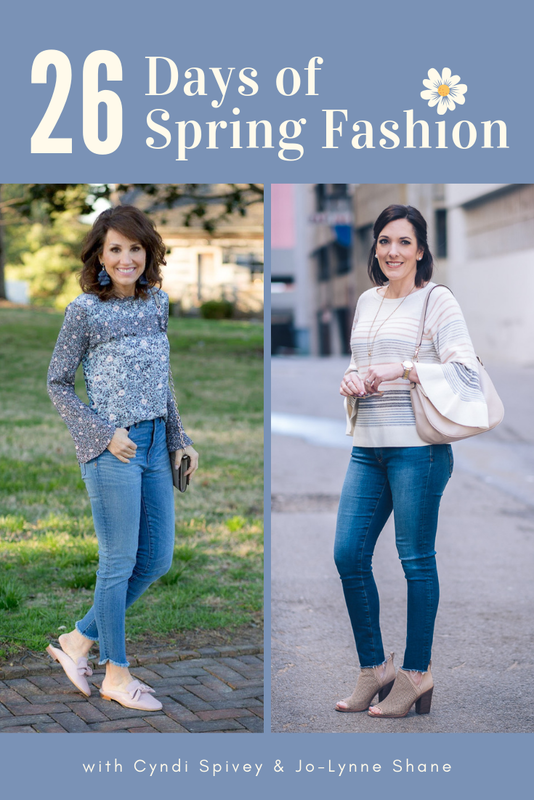 I’d love for you share your style by linking up a recent fashion post(s). If you join us, please keep it fashion-focused and be sure link back to Fashion Friday within your post(s). I’d also love to connect on Facebook and Instagram! If you’re here for your weekly dose of fashion inspiration, you’ll find plenty of that here. Have a beautiful weekend! Love this! I have a pair of the thicker leggings and wear them a lot. Jo-Lynne, I love this outfit. I don’t wear leggings very often myself, but every once in a while, it is definitely a leggings day! I love those boots and the tiny check print on your leggings. This is my favorite type of outfits, sleek and chic. I have the Loft leggings, heathered seamed ponte, in two colors (gray and maroon.) I wear a lot of leggings with boots to work, and these leggings are wonderful. They are heavier than many leggings, and they fit beautifully and wear well. Quick Comments: 1. When it comes to exercise, a SLOW 2-miler is 100% more than doing nothing. Heart rate goes up and research has shown that brain activity does, too! 2. It’s so wonderful when kids come home from college for a holiday break, and when they go back there is a weird emotional backlash, so maybe that is adding to your January blahs. 3. Loved the fashion forecast — thanks for the heads-up!! The home tour is really a treat — thanks to your family for putting up with us! Your snow storm prep is right on — wine & coffee — and I live in Montana so I am an expert! Really like how you put this monochromatic look together with leggings… I do like my black leggings on those extra comfy days I’m looking for around the house. I do try not to wear them outside but will on occasion to run some quick errands especially during the winter months with the riding boots. Love those graphic t’s I’m a sucker for them 🙂 having at least 4 in my drawer. Muahahaha….welcome to the darkside JoLynne! Glad you decided to give leggings another chance. Ponte leggings are a good gateway choice. LOL! Love the way you’ve dressed these up in a sleek and sophisticated look! I’m the same way when it comes to leggings. They are comfortable for sure, but I definitely prefer wearing jeans. I’m wearing my new AG jeans that you linked to recently at Nordstrom Rack I think, and they are amazingly comfortable. Ha! Now that I’m thinking about it, I’m also wearing my new maroon layered vest. 😁 Two great purchases!! That said, I really love the outfit you’re wearing today. I may have to check the leggings out. So glad you love your new AGs!!! You look so nice in this outfit, and ready for anything. Reading this post made me realize that I have two pair of black pants in my closet that are actually nice leggings. Duh! Both are thicker, dresser fabric than the knit leggings, and I do feel presentable in them. I just need to wear them more! I have an idea for a post that won’t require you to share an outfit. You know how you’ve done individual posts on handbags and shoes. Well, what about a post showing just shoe choices and handbag choices together? No clothing necessary. Let’s say I am going to carry my bright yellow handbag. I get so frustrated trying to select the color shoes that will help pull the outfit together, without being match matchy, and I bet there are several options that I am not seeing. Thanks! Don’t forget the bread, popcorn, and cocoa when you run to the store! I hear ya on that! That’s a great post topic. So crazy… I was literally thinking about you and leggings a few minutes ago. We are driving to VT tonight and I wanted to wear leggings for the ride so I’m comfortable but also want to look nice enough (in a casual way) if we stop to grab a bite. I knew you previously had a legging post with tips on top length etc. and was hoping you would post again soon so I could find a seater that does not look like a “mu mu” Thanks! Haha! Too funny. Yes, this tunic is perfect. Not at all voluminous but not clingy either and covers just enough. Love the monochromatic look! Very chic. Funny thing, I had pulled out my black point leggings to wear to work today with a tunic and boots. I’ve had mine for awhile but last night I thought to take them out for the reasons you mentioned. They are thicker than leggings and also warmer but skinny enough to wear with tall boots. Our South Texas weather is wet and dreary today so it’s a perfect outfit. I like the monochromatic look because it can go casual or dressy if needed. Thanks for sharing and enjoy the snow. This is one of the reasons I think OTK boots will continue for awhile. They are a perfect addition to leggings so you feel more covered up!! I don’t wear my leggings a ton, but it’s a nice variety, like you said!! And in a way, tunics are like dresses, so it can seem nice and not a cop out depending on the style. This has been my favorite go to outfit for the last couple of weeks. Didn’t even pull a pair of leggings on last year. However, with a few new tunics and longer cardigans I’m mixing and matching up a storm! Thanks for sharing!! I like the subtle check pattern. They look less like leggings and more like skinnies. I have one pair of leggings and they are a thicker, two tone dark grey/black. I wear them when I want to be super comfy and only with a tunic top and tall boots. I’m with your school of thought. It’s just as easy to put real pants on as leggings. I love this outfit and love it on you. I know what you mean about leggings and people wanting to not deal with real pants. However, I like jeans, I just have a hard time finding some that fit right. This is embarrassing to say, but they always fall down under my stomach. I am only 5 feet tall and hold my weight in my middle. So finding jeans is a struggle. The leggings seem to fit better. I wish I had your shape. Hi Jo-Lynne! Really like this outfit!! I don’t have over the knee, but I think riding boots would be ok, too. Can you give us a size reference on the leggings? Thanks! Riding boots definitely! I have the small. I have one pair of black leggings and have yet to wear them! I’m just such a jeans person and I love them even around the house. I did end up finding a pair of gray jeans the other day that I have been hunting for, for a couple of years, and when I got them home, I realized they don’t have any side seams on the outside of the leg. They didn’t specify they were leggings, but without the seams, they do feel more like leggings, so I have the best of both worlds. Comfy like leggings, but a little more structure. Enjoy your snow! Only JLS can make me rethink my dislike of leggings (“Leggings are not pants” is my mantra with my daughter!) That is a terrific outfit and all the coverage and thickness perfect. You look fabulous. Love those ponte leggings. The pattern really dresses them up. I’m not theoretically opposed to leggings if done well, like you were saying, but I just don’t grab them and put them on much. Not sure why. I’m also wearing leggings (and all black) in my post this week—great minds think alike! 😉 Seriously, though, this is such a perfect cozy winter outfit. Love! JoLynne, What size are you wearing in the sweater? I love it! Love this outfit on you. I don’t know why you don’t wear leggings more. You look great in them. I agree though, they need to be the ponte thicker ones if we go out of the house. You have longer sweaters and with the knee hi boots you have too, you really should wear them more. Perfect outfit for movie night out too. 🙂 I love the comfort thats for sure. Can I ask what size you ordered? I wear size 4 jeans/pants at Loft but only XXS and XS left in the leggings. I may need the small. Jealous of the snow. I want it so bad. I got them in a small. Your timing is perfect! And I love this outfit. I was meeting a friend for lunch today and was debating what to wear on this gray chilly, Philly day. I read your email over my morning coffee and there you were with the answer. I had a similar pair of leggings from Ann Taylor last year and the other wardrobe basics were in my closet. But I needed your help to turn them into an outfit. So thank you! These tall boots look great with the leggings! I love your new Friday fashion post format with the check marks so I can tell what other bloggers’ sites I have visited. What a thoughtful touch, thank you. Okay, now, this is gorgeous. The mix of textures really make this work so well. For lack of a better description, I love how the glossiness of the bag and boots stand out and really are the perfect compliment to the top and leggings. Just beautiful! I have a question about what kind of shoes to wear with a cute pair of pinkish spring colored leggings that I just bought yesterday for this spring. I live in FLA so most of the shoes are flip flops but not for this girl. Flips flops to me are tacky. So any suggestions on a cute shoe to wear with my leggings? I love your neutral look. I love how your leggings have a pattern on them because adds dimension and style!